President Trump's updated new look was unveiled when he stepped into the House of Representatives chamber Tuesday night. The Trump style that society has come to know features blaring red ties, hanging well below his waist and covered by a boxy suit jacket that always seems to be open, and longer jacket sleeves. Designer Joseph Abboud, creative director at Men's Warehouse, told Inside Edition that the changes are for the better. "This is a very visible way of saying he knows how important the job is and you have to present yourself that way," he said. The sleeves of the jacket were shorter this time around and his French cuff shirt and cuff links were fully visible. "I always recommended that men should button their suits," Abboud said. "When you sit down, you can unbutton it," he said. Trump, who is known to be super-sensitive to criticism, has been mocked for his outdated look by comedians and fashion experts. Earlier in the year, GQ magazine offered its advice with an animation showing how his jackets should be slimmer and buttoned, his sleeves shorter and his ties thinner. But the new look doesn't appear to have stuck, as Trump stepped out Thursday wearing his tie below the belt and a wide-open jacket. On Thursday, Melania Trump was dressed down as she met with children at New York Presbyterian Hospital in Manhattan, reading Dr. Seuss' Oh, The Places You'll Go to them. US First Lady Melania Trump laughs with two guests before US President Donald Trump addresses a joint session of the US Congress on February 28, 2017, in Washington, DC. First lady Melania Trump (R) arrives to a joint session of the U.S. Congress with U.S. President Donald Trump on February 28, 2017 in the House chamber of the U.S. Capitol in Washington, DC. Trump's first address to Congress is expected to focus on national security, tax and regulatory reform, the economy, and healthcare. First lady Melania Trump arrives to a joint session of the U.S. Congress with U.S. President Donald Trump on February 28, 2017 in the House chamber of the U.S. Capitol in Washington, DC. 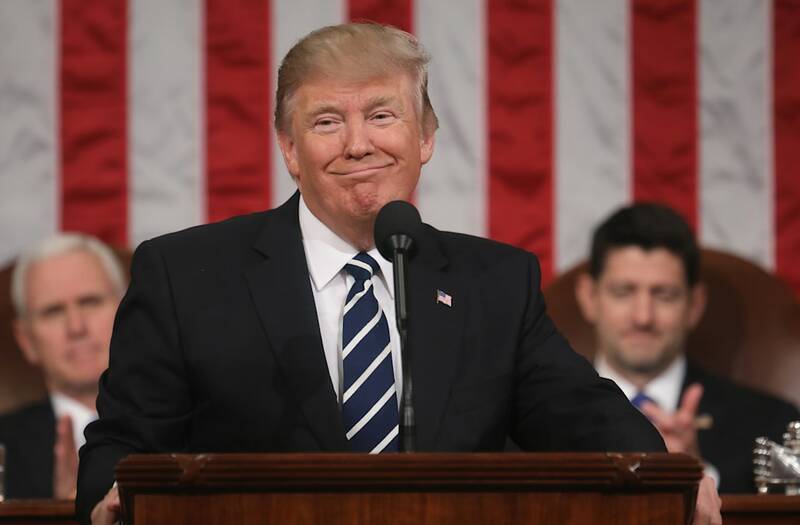 Trump's first address to Congress is expected to focus on national security, tax and regulatory reform, the economy, and healthcare. She wore slim trousers with a sweater, draping with her coat over her shoulders as she made an appearance to mark National Reading Month. "I came to encourage you to read — and to think about what you want to achieve in life," the first lady said.